the system (chemicals) to the surroundings. The products have less energy than the reactants. from the surroundings to the system (chemicals). The products have more energy than the reactants. carbohydrates such as glucose in respiration. 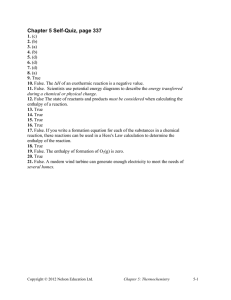 reactants and products being in their standard states. combusted completely in oxygen under standard conditions. 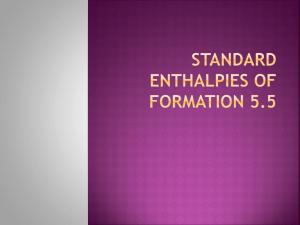 Enthalpy changes are normally quoted at standard conditions. solution to the cup first and then add the solid weighed out on a balance. 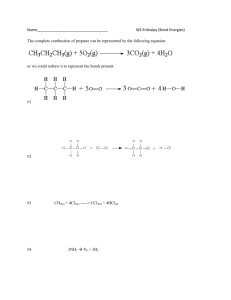 the reactants were added together. before addition and an average temperature is used. solutions have the heat capacity of water. energy absorbed by the apparatus. • reaction or dissolving may be incomplete or slow. • density of solution is taken to be the same as water. copper sulfate was reacted with 0.0100mol (excess of zinc). The temperature increased 7.0 oC . 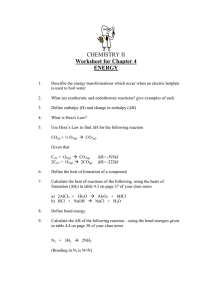 Step 1: Calculate the energy change for the amount of reactants in the calorimeter. solution only. Do not include the mass of zinc powder. Step 2 : calculate the number of moles of the reactant not in excess. using the balanced equation which one is in excess. Example 2. 25.0cm3 of 2.00 mol dm-3 HCl was neutralised by 25.0cm3 of 2.00 mol dm-3 NaOH. 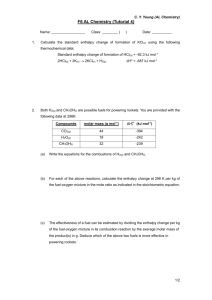 Calculate the enthalpy change per mole of HCl. 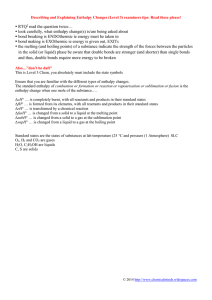 mass of alkali, as they are both solutions. Step 2 : calculate the number of moles of the HCl. is used to heat up water in a metal cup. Step 1: Calculate the energy change used to heat up the water. Step 2 : calculate the number of moles of alcohol combusted. show the different routes a reaction can proceed by. directly by experiments. 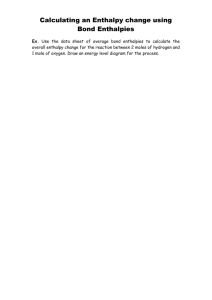 Instead alternative reactions are carried out that can be measured experimentally. water to form a solution of copper sulfate. 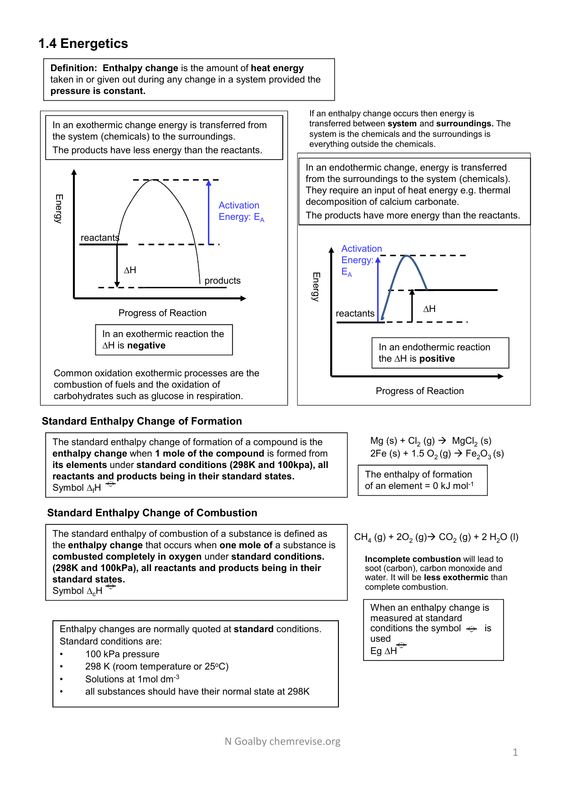 Using Hess’s law to determine enthalpy changes from enthalpy changes of formation. Using Hess’s law to determine enthalpy changes from enthalpy changes of combustion. energy is required to break a bond. following mean bond enthalpy data. Example 9. 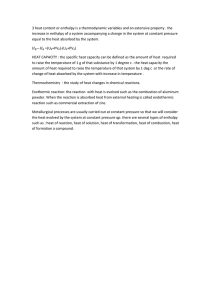 Calculate the enthalpy of formation of NH3 using the following mean bond enthalpy data. Calculate ΔfH for propane, C3H8(g), given the following data. enthalpy of combustion increases by a constant amount. because there will be significant heat loss.